Patronus Analytical is an organisation that analyses security in support of humanitarian agencies. 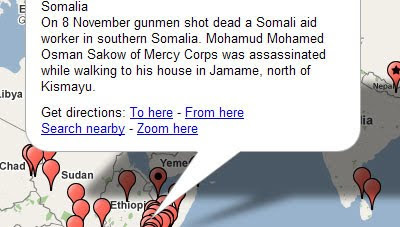 They have produced a Google Map showing the locations of the deaths of humanitarian aid workers due to violent incidents and work related accidents in 2008. Underneath the Google Map there is an accompanying heat map. Both maps show that Somalia and Pakistan in particular are hugely dangerous places for aid workers to be working. More cartographic data can be found in this vector based file of Somalia map in Adobe Illustrator, download now maps vector clipart. The maps can only make you feel even more high regard for individuals who are prepared to dedicate their lives to helping others in the troubled places of the world.